Health experts estimate 37 million Americans are affected by inflammation of the sinuses every year. When you have a sinus inflammation, the mucus membranes of your nose, sinuses and throat become swollen. This swelling will prevent normal drainage. When your sinuses can't drain properly they will clog up, causing you not to be able to breathe through your nose, and this will cause a sinus infection. It doesn't matter if it's winter or summer, the wind will cause a sinus infection for me. Luckily many people have stopped smoking and it's not allowed in bars and restaurants anymore. I used to go out to a bar or restaurant in the evening, and know I would have a sinus infection the next day from the smoke. It is an allergic reaction to the smoke for me, and it could be for you too. The bad part is, it's not just tobacco smoke. I can experience the same sinus inflammation from a great campfire which I really enjoy, but sometimes it's just not worth it. Before we got an air purifier we had a musty, mildew smelling basement. If I spent too much time down there I would develop a sinus infection and I could be sick for a few weeks. Spring time pollens are a sinus inflammation trigger also, and I know that's true for many people. A quality air purifier will help tremendously with that problem. I don't think I have ever had just a cold. Mine always turns into a sinus infection, and I'm sick for at least a month. 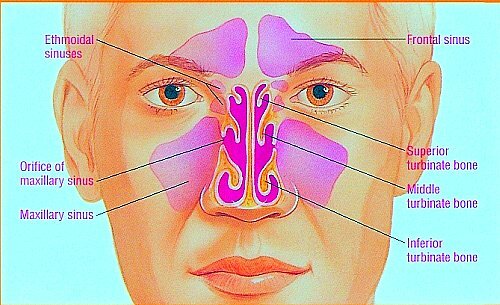 These growths could block the nasal passages or sinuses, causing inflammation. This is the wall between the nostrils. This may restrict or block your sinus passages. The majority of people with asthma also have chronic inflammation of the sinuses. It requires at least 10-14 days of antibiotics to clear up the infection. Antibiotics should be your last resort. They will kill the bacteria that is causing the infection, but they also kill good bacteria that your body needs. Hot Packing the sinuses several times a day will often open them up and prevent a full blown infection. Just use a damp towel or wash cloth, as hot as you can stand it, and apply it to the sinus areas until the cloth becomes cool. Keep repeating this for at least 10 minutes if you can. Add some essential oils or even Vicks Vapo Rub to help open up the sinuses. This will help keep the mucus from becoming too thick and causing inflammation of the sinuses. You probably feel tired and run down from fighting the sinus inflammation anyhow. Just listen to your body. They also snap and crackle. A cup of hot water with 1-2 tbsp of honey is very good also. I learned this from Chunyi Lin the founder of Spring Forest Qigong . Master Lin says hot honey water is good for the lungs also. It will be better if you take a vitamin C supplement and avoid all the sugar that is in the orange juice. Taking a high quality omega 3 supplement for sinus infections will help to prevent chronic sinusitis by controlling inflammation in your body.
. Be sure that you find a company that uses only fresh coconuts to make their oil. Many of it is made from dried coconuts and is an inferior product. ---This has anti bacterial and anti viral properties. Dust and dust mites are a source of allergens and sinus problems. Running your air purifier in or near your bedroom will make a huge difference in how you feel. Swedish researchers have found that humming can help maintain healthy nasal passages and avoid a sinus infection. Humming increases the amount of air exhaled from the nose versus other common exhalations, which could lower the risk of asinus infection if done routinely. Put a few drops of the essential oil in a bowl of very hot water and inhale the vapors to relieve your inflammation of the sinuses. Most of your symptoms of inflammation of the sinuses should clear up within a month. However, once in a while there can be serious complications. If a sinus infection passes through the bone, it can infect the lining of the brain -- meningitis -- or even the brain itself. Both problems are life threatening. A sinus infection can also spread into the orbit of the eye, possibly causing blindness. And, sinus inflammation can lead to potentially fatal aneurysms or infected blood clots. These complications are rare. Less severe complications include asthma attacks and loss of smell or taste. Pott's puffy tumor is also a serious complication of bacterial frontal inflammation of the sinuses. One of my grandaughters had a Pott's puffy tumor when she was eleven years old. It is sad to look at. It causes a large section of the forehead to very noticeably protrude, and it is painful and dangerous. It sometimes requires surgery to drain the tumor and then 6 weeks of IV antibiotics. My grandaughter didn't have surgery, but she did have the 6 weeks of IV antibiotics. Luckily my daughter inlaw was a nurse at the time, and could administer the IV's at home. After she had the Potts puffy tumor, she now has developed asthma. Health experts have suggested that chronic sinus infection and asthma may be the same disease manifested in two parts of the respiratory system: upper and lower. I'll be watching for more research into that. NIAID-(National Institute for Allergy and Infectious Disease) supported research is examining whether chronic sinus infection can be caused by an unusual reaction to fungi normally found inside the nose and the sinuses. One study has recently shown that when blood cells from people with chronic sinusitis are exposed to fungal material, those cells make chemicals that produce inflammation. This raises the possibility that fungi may play a role in some cases of chronic sinus infection. A new study attributes nearly 100% of chronic sinus inflammation to mold. Something even more frightening is 50% of homes contain mold. Do you have information that might benefit someone?